Hong Kong’s Ovolo Central now resembles a whimsical playground of imagination. Four new entrances, a glazed, black metal grid that maximises natural daylight and maximises ventilation and a suite which encompasses the entire top floor are some of the highlights unveiled by Ovolo Hotels in a comprehensive revamp of its flagship Ovolo Central in Hong Kong. The company’s first hotel has stepped up its game even further in terms of its quirkiness, with new modern artworks including a stainless steel ‘egg wall’ and lobby seating surrounding a fireplace. Stairs connecting the ground floor with the first lower ground are now connected by a linear staircase to further accentuate the effects of daylight shining inside. All 41 rooms have been reimagined with new custom artworks, fabrics and personalities. Each of the Monique McIintock Interiors-designed room oozes a rock-n-roll vibe offering guests a drinks cabinet, free high-speed wi-fi, Nespresso coffee machine and in-room Amazon Alexa device. On the top floor, the hotel’s iconic Radio Suite now measures 700 square metres, designed by ALT-254. A number of brand hallmarks are unchanged, with guests able to make use of free self-service laundry facilities and free access to the hotel’s fitness centre. 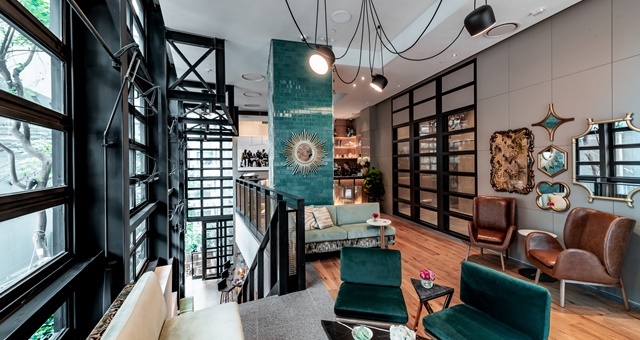 “Ovolo Central was my very first hotel, and what we’ve created here is a ‘New Sensation’ right in the epicentre of Hong Kong,” said Ovolo Hotels Founder and CEO, Girish Jhunjhnuwala. Additional features of the new-look Ovolo Central include a first-floor meeting facility with private balcony, decorated with artwork commissioned from MAKE. A new dining concept has also been unveiled, with VEDA becoming Hong Kong’s first hotel-based vegetarian restaurant. The menu has been designed by renowned plant-based chef Hetty McKinnon, with notable inclusions being a wine list dominated by Australian labels.